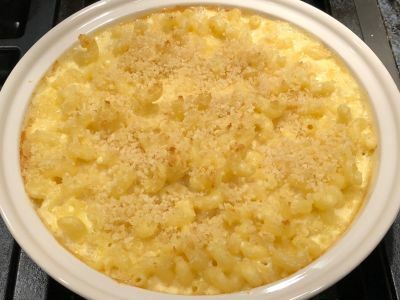 Baked macaroni and cheese is quite often dry. 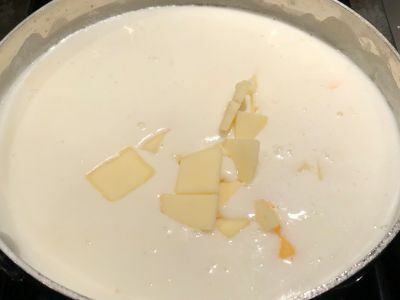 That is a function of the cheeses being used more than the amount of liquid in the cheese sauce. Whether it's cheddar, Jack or Colby, it will dry out as it sits and most often is dry right out of the oven. So after some experimentation, I found that the addition of Velveeta fixes that and does not really alter the flavor. And it is even moist reheating the leftovers the next day. Perfect! I know, I know, but Velveeta? Yes. Let's be serious, this is not a gourmet dish. Some people will put lobster in it to make it more upscale but to me that just seems like a waste of perfectly good lobster meat. But as I have said many times, if you like it, go for it. However, you can make this dish interesting by changing up the cheeses. Check out the Make It Mine section after the recipe to see some recommendations. This is meant to be a "starter" recipe. Give it a try and if you like the consistency you can then fool around with the other cheeses you put in it. If it is still a little dry for you, go ahead and add a few more ounces of Velveeta. 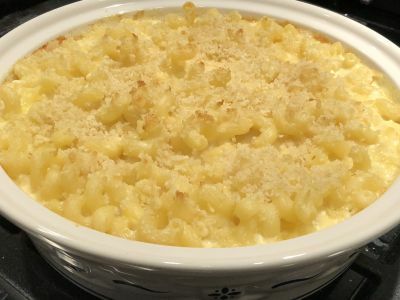 To be honest, my go to Stovetop Macaroni and Cheese uses only Velveeta with some butter and a little milk and it's so easy to make and really good, especially with cut up hot dogs in it. And trust me, the kids will love it! So give it a try and let us know how you change it to make it your own. Enjoy! 2. Add 3 quarts of water and 1 tablespoon of salt to a sauce pan large enough to hold the pasta and bring it to a boil. 4. 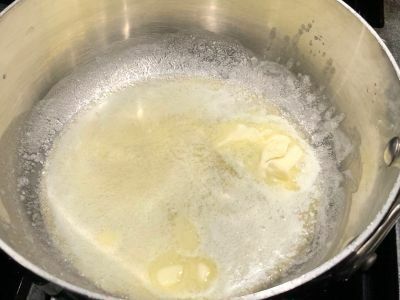 Run cold water into the pan until the water in the pan is cool. 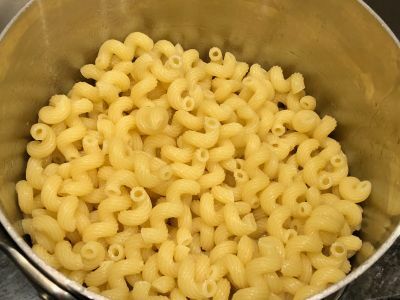 Drain the macaroni in a colander and return it to the pan. 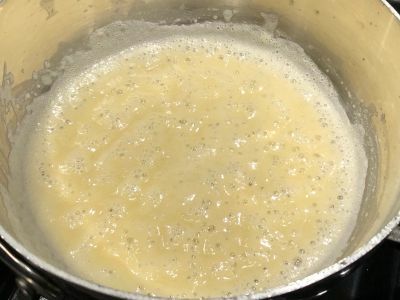 Add a tablespoon of olive oil to the macaroni and stir it to fully coat with the oil. 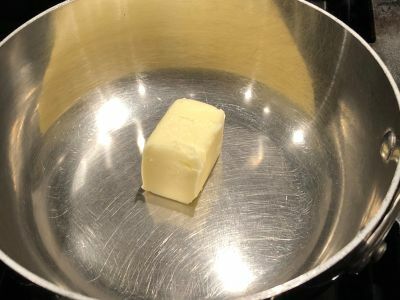 Let it sit in the pan until you are ready to use it. 5. 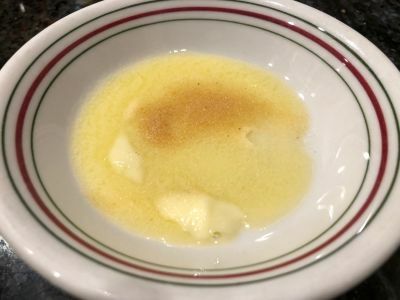 In a saucepan, melt the 3 T butter over medium low heat. 6. Whisk in the flour and cook for about 30 seconds whisking constantly. 7. 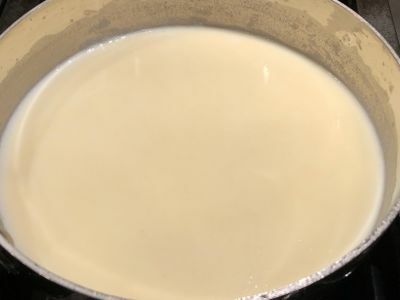 While whisking the roux, add the milk and the salt and celery salt and stir until the sauce thickens slightly, about 4-5 minutes. 8. Add the cheese and stir until melted, about 3 to 5 minutes. 9. 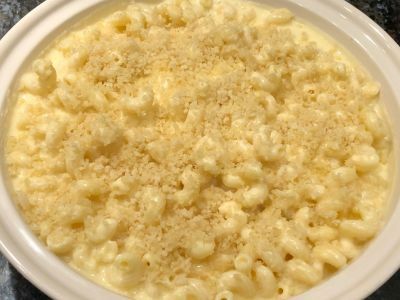 Combine the macaroni and the cheese in a 2 quart shallow casserole until it is thoroughly mixed. 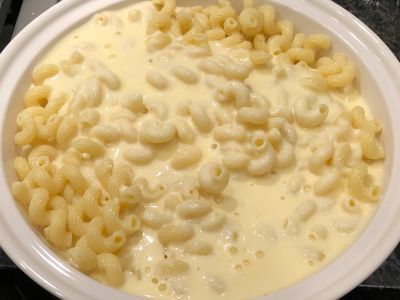 You can do this in the saucepan with the macaroni if you want and then pour it into the casserole dish. It is a little less messy that way. 10. 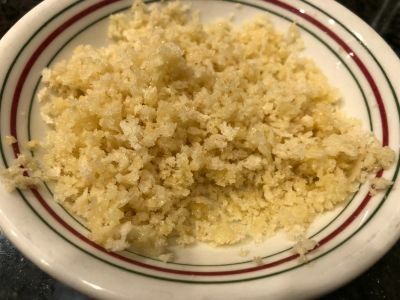 For the bread crumb mixture, melt the butter in a bowl in the microwave until just melted. 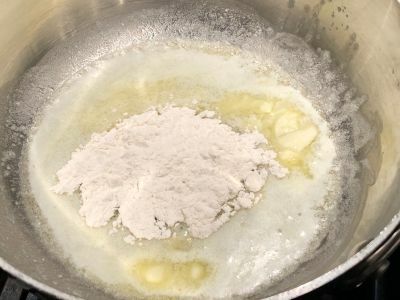 Mix in the garlic powder and then add the bread crumbs and combine until it is thoroughly mixed. Sprinkle on top of the casserole. 11. Bake in the oven until it is bubbly and lightly browned, about 20 to 25 minutes. This can be served right away or it will keep warm in the casserole dish for a while. Keep the leftovers (if there are any) in the refrigerator and heat them up when you are ready. You can eat this as a side dish with a nice baked ham or as a main dish all by itself. The best comfort food ever! Enjoy! 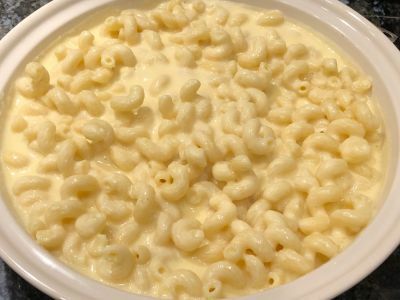 In this recipe the cheeses used are Cabot Vermont Cheddar and Cabot Monterey Jack along with the Velveeta . It calls for 6 ounces of each of the cheddar and Jack and 4 ounces of the Velveeta. 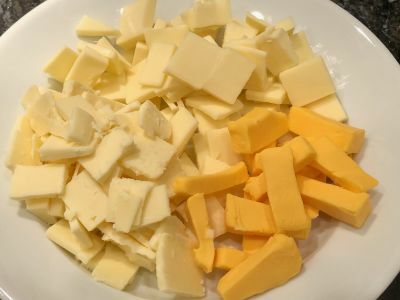 You can very easily substitute either or both of the first two cheeses and increase or decrease the amount of Velveeta. 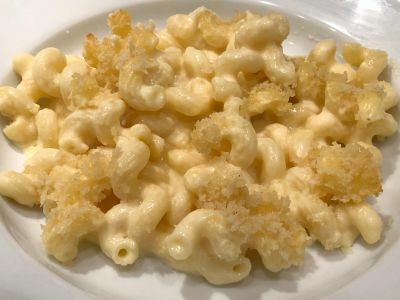 So consider using any melting cheese such as Colby, Gouda, Gruyere, Fontina, etc. So experiment with different cheeses and let us know how it comes out. 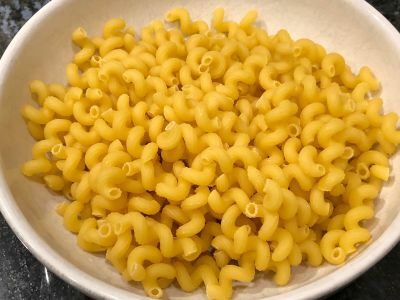 Regarding the pasta, the traditional shape for macaroni and cheese is elbow macaroni. But you can use any pasta you want. 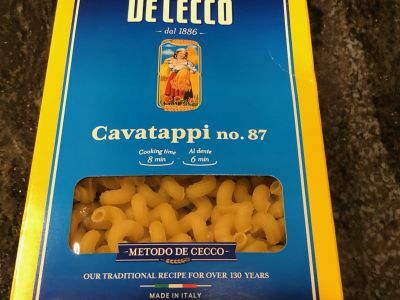 I like Cavitappi which is what is used in this recipe. It is like an elbow but larger and in the shape of a corkscrew. Also try Fusilli, Ziti, Rigatoni or Penne. Have some fun and make it your own! For the baking time, just remember, the longer you bake it, the drier it gets so if you like it moist, keep your baking time shorter. All we are trying to do here is heat it, everything is already cooked so we are not "cooking" anything. And if you like the top extra brown, place it under the broiler for a few minutes, just remember to keep an eye on it. You can also sprinkle some cheese on top before you put the bread crumbs on and before you bake it. If you are going to do that try a yellow cheese like cheddar.